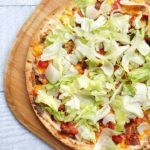 This BLT Pizza is a unique and interesting approach to pizza! Preheat your oven according to your crust's directions. In a small bowl, mix together softened cream cheese and the ranch dressing until equally combined. Using a small spatula, spread cream cheese mixture over the crust in an even thin layer. Top with cooked bacon, diced tomatoes, and cheese. Sprinkle with garlic powder. Place in oven and cook according to package instructions or until crust is crisp and cheese is golden brown, about 8-10 minutes. Once cool, sprinkle the lettuce over the top and then cut into slices. Enjoy!